This was the second day of the Las Vegas adventure with Happy Meal. We made our way to Stripburger for lunch. It was across the street from The Palazzo, where we had plans to have Happy Meal try the Birthday Shake at I Love Burgers at The Palazzo Shops. Stripburger offered mostly outdoor seating, and on this day the temperature was a brutal 108. Fortunately, the mist cooling system was working, so we enjoyed the pleasant and surprisingly effective luxury of evaporative cooling while enjoying an afternoon view of the Las Vegas strip. Our server, Nick, was a burger lover, and he was highly knowledgeable and conversant about the various burgers in Las Vegas. He was confident that we were about to enjoy one of the finer burgers in the city. The executive chef of Stripburger, Terry Lynch, also headed up things at Mon Ami Gabi over at Paris Resort and Casino. Both Stripburger and Mon Ami Gabi were part of the Lettuce Entertain You group. We ordered two of the Cheeseburgers ($9.95), an order of the Fresh-Cut Fries ($3.95), and a couple of soft drinks. Our cheeseburgers arrived in about 15 minutes. The Beef: The beef was delicious. It arrived, pre-ground from Brandt Beef. The burger was a blend of Brisket, Chuck, and Chuck Roll. The burger blend was ground coarsely, so each bite kept one mindful of the grain of the Brisket, which one was chewing. The fat content was about 20%--the fat in the burgers seemed to be right at the edge of acceptable without pushing past. The beef was quite juicy, and it quickly soaked the bottom bun. The bite was complex with strong beef and steak notes. There was also a faint taste of aging--the beef was wet-aged for 7 days. The beef was a solid win. Chef Lynch was a stickler for beef quality and sanitation. He chose Brandt Beef, since they had an impeccable reputation and delivered a quality product. We had encountered Brandt Beef previously, and it was a really fine choice in most cases. 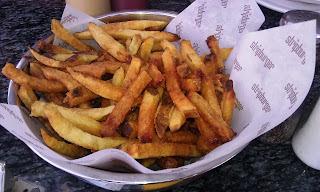 The Seasoning: The exterior of the burgers at Stripburger were seasoned with salt and pepper as they were cooked on the grill. Happy Meal proclaimed that the pepper was what made the burgers exceptionally good--he was correct. The pepper rounded out the flavor nicely. The Sear: The sear was weak. 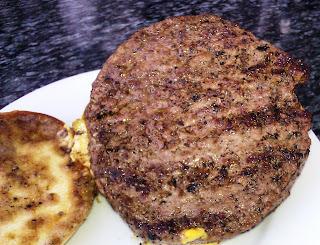 There were light grill marks on the burger patties, but the grill did not develop a proper sear. A good sear would have taken this burger to a higher level. The Preparation: The beef was custom ground by Brandt Beef and delivered to Stripburger. The burger patties at Stripburger were loosely packed and handled perfectly. These patties were formed once or twice per day, depending upon demand. The burgers were turned once on the gas grill, so they retained a lot of juices. The Cheese: There were 6 cheese choices. We went with the American. 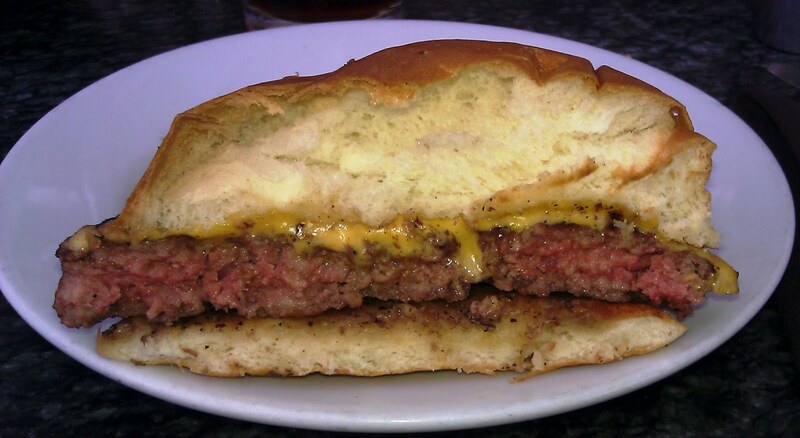 The standard American cheese, was perfectly melted over the burger patty, and it fused the top bun its surface. The cheese worked its way nicely into the interstitial spaces in the loosely packed, coarse grind. This served to bind the dish together. The Bun: The standard, sweet, moist, yeasty, burger buns were sourced from More Than Bread. The buns were a custom creation for Executive Chef, Terry Lynch. 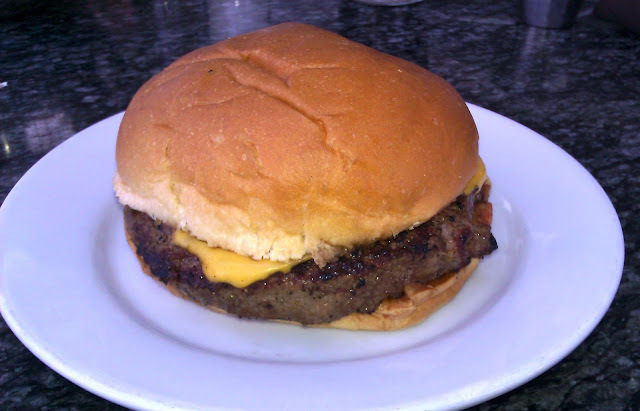 The gentle sweetness of the bun worked well with the savoriness of the burger and cheese. The bun was warm but barely toasted. As a result, it offered no crunch and little resistance to saturation of the bottom bun. The bun was firm enough to stand up to the burger. The Meat To Bun Ratio: Perfect. The last bite was identical to the first. The Toppings: The lettuce was shredded Iceberg, and it was fresh. The tomato slices were sweet and juicy. Since the bun was lacking texture, these toppings were best left off to avoid saturating the bun. The Fries: CRISP! These house-cut, peel-on, par-cooked fries were what Five Guys Burgers and Fries should have been serving. The fries were earthy, golden brown, and hot. They were also well-seasoned with granulated salt. The canola used to cook the fries was fresh and at the perfect temperature to create a proper french fry. The fries were flawless. The Value: 2 Cheeseburgers, a huge order of fries, and two soft drinks set us back about $32. Considering the strong quality of the beef, the value was average. I generally try to only 50% of each of the burgers that I sample, but in this case I wanted to eat the whole thing. Happy Meal polished off his burger and commandeered half of the burger that I had set aside. Happy Meal was wildly enthusiastic about the Stripburger fare. This burger really appealed to his tastes. I was pleasantly surprised at the quality and flavor of my burger, as well. A proper sear on the beef and toasted bun would have put this quality burger over the top. Burger Review : A high-quality and very tasty burger was served up at Stripburger. It pleased palates both young and grown-up.